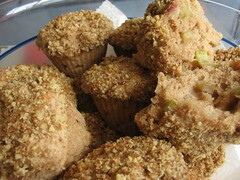 Rhubarb Muffins with Walnut Streusel - Do You Know The Muffin Man? Notes: Another early morning pre-work project. Not much to say about these; they're easy to make, contain whole grain flour and taste pretty good. I ground the walnuts a little too finely for the streusel topping though.